Above: The Khaya Jabula Ranch Yurt, near Edgewood, marries glamour and camping—"glamping". Photography Courtesy Khaya Jabula Ranch. BACKCOUNTRY TRAVELERS rejoice at the sight of a packed trail through the snow. Like a landing strip, it signals a great way to cross-country ski or snowshoe into and out of the woods. And for travelers heading to a yurt (sort of a cross between a tent and a hut), it marks a way to revel in the outdoors and still enjoy wood-burning stoves, warm beds, and a nice glass of wine. The trail to Bull of the Woods Yurt, part of his Southwest Nordic Center collection, is no exception, even on a good day. From the trailhead in the Taos Ski Valley, the hike rises a steep 1,500 feet in 1.8 miles. The terrain then levels out and the view opens up at Bull of the Woods Meadow, where the yurt tucks in among the trees. Drifts can pile as high as the deck railing, but usually no digging is required to reach the door. 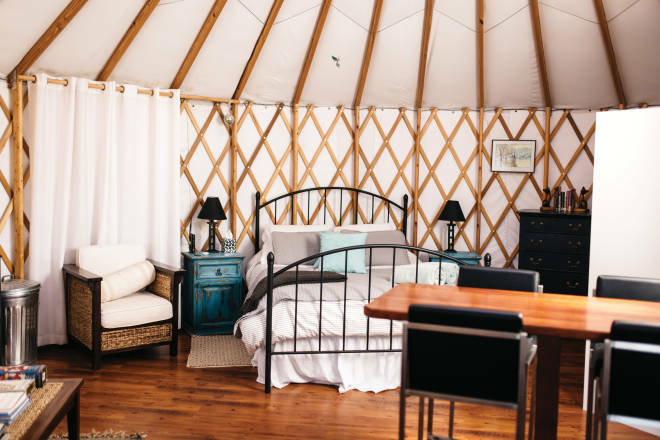 Inside the yurt, a canvas structure on a fixed wooden platform, visitors are met with beds and a wood-burning stove that quickly warms the space and supplies an ambient glow, aided by propane lanterns. For those hardy enough to haul in libations, wineglasses await amid a stock of kitchen supplies that include five-gallon stainless-steel pots for melting snow. Board games and cards add family-style entertainment options. “They’re set up pretty simply, but everything you need is there,” MacLennan says. The yurt boasts access to some of the highest ridgelines in New Mexico. Ambitious skiers can head toward Wheeler Peak, the state’s tallest summit, and chutes that offer turns for thousands of feet from the stunning high-alpine starting line. Snowshoers can wander the snow-dressed woods and capture stellar views. More intermediate tree skiing lies to the northeast. The hike to the yurt avoids avalanche terrain, but explorations could quickly lead to places where a beacon, shovel, probe, and some backcountry know-how would help. Plan and pack accordingly. MacLennan marks the trails and posts topographic maps to them but cautions that stopping to navigate can steal hours and lead to headlamp-lit arrivals. The yurt sleeps up to 10, and goes for $100–$145 a night through southwestnordiccenter.com. Stays between late January and mid-March are the best bets for waking up to inches of fresh powder. Whether the night sky is a carpet of stars or a jumble of snowflakes, hover outside in the silence, and the reason for your effort will be as clear as your drumming heartbeat and clouds of frozen breath. New Mexico boasts several yurt options, not all of which require skis. For some, bring your own sleeping bag, food, winter clothing, and solid route-finding skills. Always pack a headlamp, plus warm shoes for inside the yurt; bonus points if those shoes are waterproof for trips to the outhouse.